Here’s the thing: in large measure, our decisions determine who we become and who we are. The bad part about this is that we often don’t realize that we’ve made a decision, or that there is an option–a decision to even make. I have yet to use the idea because, quite simply, not every idea is worth using. But I was thinking about books and characters and conflicts early on. During high school I wrote two books. Wrote another the year after. After a two-year break, I re-wrote one of the books. Then I made a choice. I bought a little computer game called StarCraft. I remember talking with my wife about the decision because I was quite conflicted on the matter. At the time, money was tight (I worked 30 hours a week as a phlebotomist to support my little family), and $50 was a big spend for us. I have no idea where I even got the money. Probably a gift of some sort. I was debating between StarCraft and something called Ultima Online. I clearly remember her dubious expression: eyebrows raised, mouth a thin line. I may have even said that it might affect how much time I could spend with her. If I said that, it was clearly a stupid thing to say. Back then, I said a lot of idiotic things. I think I’m better, now–at least, a little bit. (I at least know not to say–or even think–that something might take time away from my wife). Anyway, at the time, I was making the choice between one game or another. What I didn’t know was that I’d already made a choice–to buy a game–that would steer me away from what I really wanted. I wanted to write and publish books. Little did I know that the decision to buy any game would derail my efforts for about 8 years. You see, I bought StarCraft. That led to other game purchases, and the next thing I know, it’s 8 years later and although during those 8 years I had abortive starts at writing, I mostly dropped it for this other hobby. That decision to buy a game–quite small, really–took me down a different path than I really wanted to take. I thought–and professed–that my priority was to write and publish books. In reality, during those eight years my decisions demonstrated that my priority was for leisure in the form of video games. In the end, I’ve realized there’s value in taking a look at what we really want out of life, and evaluating whether or not the daily decisions we’re making are leading us there. If not, maybe it’s time to change. Three and a half years ago, I made the decision to change my course. No more video games. Instead: writing. Last week I spent Wednesday night digging a hole, Thursday down in the hole, and Friday filling the hole. By the time it ended, the hole had assumed the title of “The Hole” and phrases like “I’m going in” had become part of the vernacular around our house. I learned several interesting things while dealing with the leak four feet under ground, where our main water line meets our sprinkler line, but one of them stood out far more than others. Namely, it’s good to have a wife. No, really. I mean it’s, like, really good. It’s easy to take her for granted. Married fifteen years in January. She’s always there. I’ve got dinner ready for me every day when I get home from work, and it’s usually tasty. (Just kidding, dear, it’s always tasty.) Not to mention the magic clothes hamper. It’s amazing. You put your dirty clothes in there, and a few days later they magically appear in your closet. Clean, even. I swear, it’s a miracle of modern technology. Like I said, it’s easy to take her for granted, sometimes. I imagine every man is guilty of it from time to time. But as I worked in the yard, and made one of six (yes, six) trips to Home Depot in three days (I have yet to master the art of planning ahead for what I not only certainly need, but also what I might need and can later return if I don’t need it), I realized on two separate occasions just how valuable it is to have a companion around. what she thought on the matter. More often than not, she raises considerations that I hadn’t thought of and probably wouldn’t have if I worked on the problem for a decade. The next day, as I filled The Hole, I decided to fix a few other things around the yard. It just so happened that my wife was gone for a little while, and I was left alone, filling in holes, cutting out grass, and laying drainage pipes. You know, really good times. By about 2:30 in the afternoon, I was hot, exhausted, ready to give up and finish another day. I was moving slow. My back ached. My knee hurt. All very good reasons to throw in the towel. You see, somewhere during those six hours of work, I’d realized just how craptastic working in the yard all day, all alone, was. And I figured that if she would join me, not only would it be more pleasant, but I would then have half as much work to do. She laughed and gave that little smile of hers. If you have a wife you know what smile I mean. It’s THAT SMILE. The one that says you’re ridiculous but she loves you, anyway. her shoulder and gave THAT SMILE again. She did not say it. She didn’t have to. I knew it was true. I was a sissy because I could barely handle three days of yard work, when she does all the yard work, including mowing the lawn. I spend a few days out there and am reduced to a quivering pile of goo. She’s out there day after day while I sit at some cushy desk, punching away on a keyboard. chatting cheerily about whatever it is she chats about (yes dear, of course I’m listening) made the entire experience much more bearable. In fact, I’d say that it became enjoyable. loves you all the more for it. And if he doesn’t, you should give him a good swift kick in the pants so that he does. Last month I drove my family to San Francisco. Before leaving I experienced a vague nervous feeling. A sensation that things might go wrong. I shrugged it off. We packed the suitcases, three kids, electronic devices, and goodies into the car, and started out on I-80, westbound. Things went well until we left the Muir Woods National Monument and headed for our hotel on Nob Hill inSan Francisco. Even then I was confident. We had directions on the iPad. Things would go well. We passed across theGolden GateBridge. The kids, sitting in the back, gaped in awe. I did the same. How many times had I seen this icon in pictures or movies? I couldn’t help but love driving across it. Thirty seconds later, I missed our turn. But I stayed calm. We re-routed our course and found our way to the hotel. Only—the entrance wasn’t where Google said it was. Or had I taken a wrong turn? I didn’t know, but no problem, right? I could go around the block and look again. Right? An array of one-way streets on alarmingly steep hills foiled us. Not to mention the trillions of people everywhere. Every way I turned there were people. There were signs telling me I couldn’t go that way. And trolleys, looking like they would probably lose control and crush our little car. Our quick trip around the block turned into ten minutes of maze navigation. My wife’s tension level escalated. Naturally, the kids were going bonkers in the back, having a fantastic time with I have no idea what. “What are you doing?” my wife suddenly screamed. “I’m turning left!” I said. It was too late to stop. I’d already begun to turn the wheel and hit the gas. “Not that way!” she said. In the back, my kids laughed as one of them made a joke I didn’t hear. “It’s one-way this way,” I said, pointing at a sign. “No it’s not!” she said, and jabbed a finger at another sign on the other side of the intersection. My eyes found the sign as I turned into the street. To my horror, her sign directed traffic to the right. I veered as close to the side of the road as possible and stopped, dumbfounded by this urban oddity. Not in all my life had I ever come across a place where a one-way street switched directions. To make matters worse, there was a trolley right in front of us, with people getting on and off. A steep hill loomed ahead and dropped away behind us. People everywhere. The kids laughed louder. To this day I still have no idea what was going on back there. I’m sure it was hilarious. I switched to panic mode. By that, I mean reverse. I looked all around, checking blind spots and visible spots. When the way was clear, I gunned it. I backed into the street I’d just gotten off of, wrenching the wheel to one side so the rim of my front left tire scraped against the curb. Two men getting off of the trolley pointed and laughed. I didn’t care. This was it. I had to get us to safety as fast as possible. I found myself aimed in the proper direction, shifted into drive, and shot up the road. A part of me wishes that—just for the sake of this story—I’d gone down another one-way street, the wrong way. If I was writing this scene in a book, that’s how I would do it. Unfortunately, I wasn’t going the wrong way down a one-way street. In fact, in another few minutes we found our hotel and were out, buffeted by freezingSan Francisco wind and checking into the hotel. In fact, the entire trip passed without major catastrophe. Now I could return toSan Franciscowithout worry or fear. I’ve realized that my feeling of worry was completely normal. I was trying something new. I was stepping out of my comfort zone. I was going on an adventure. Adventures take many forms. Trips to new places. Moving. Changing jobs. Publishing a book. Starting school. Starting a business. Leaving home for the first time. Trying something new. Getting married. Having a baby. Adventures almost always include some level of discomfort. But you know what? Discomfort is a function of growth, and afterward you’re that much stronger. So the next time you start an adventure and you get that unsettling feeling, face it with boldness, knowing that it’s normal. Rest assured that things will probably be just fine, and that when you’re done, you’ll be that much stronger. You’ve heard of Angry Birds and hellhounds. How about hellbirds? 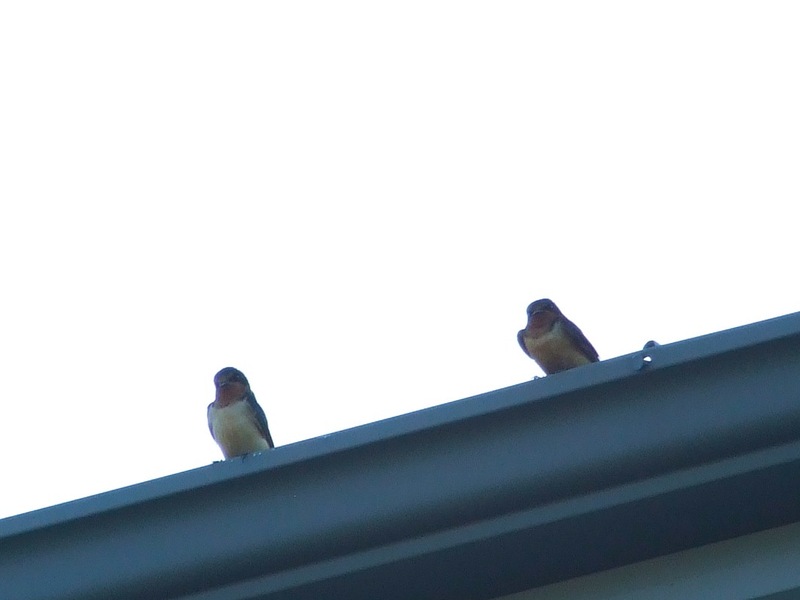 I really had no idea what I was getting into when some Barn Swallows moved on to our porch. At the time, I didn’t know we would be hosting hellbirds, but it has become evident in the last few days that yes, hellbirds have made our porch their home. When they first set up camp on our porch, I named them Lucy and Desi. I was so innocent back then. I yearn for those days. Here is a picture of the birds, taken yesterday. First of all, I have to question the parenting skills of any bird that tries to fit seven birds into one nest (5 hatched + the adults). Because as you can tell, the nest is actually pretty small. We wondered from the start how everyone would fit. Turns out they don’t all have to fit. Things were pretty good until late last week, when the babies were starting to get bigger. It was getting crowded in that nest. Next thing we know, one of the babies is on the ground, and the parents begin to get more worked up whenever we’re in the front yard. I put the baby back in the nest, but the next morning there were only four birds, and tufts of feathers spread across the front porch. I could only assume that one of the birds had fallen out and gotten et by one of the neighborhood cats. By the way, I’d taken to keeping a store of small rocks near the front porch, so I could chase cats off when they came near. The birds, apparently, did not appreciate my efforts to defend them. Late last week, after the one baby “disappeared” mysteriously, the parents really stepped up their aerial defenses. If you came inside the front yard, they would start chirping and getting all worked up, and dive near you to scare you off. Now, I’m a fan of birds. I like to take pictures of them. I like to try and identify them when I’m driving. Nothing is more fun than watching a few smaller birds chase off a larger predator bird. It’s not so much fun when I’m the predator getting dive-bombed. And in the last two days it has gotten quite intense. The birds hang out on the rain gutter above the front door (as in the first picture posted above), watching for hapless victims. They seem to have forgotten that they’re the guests here. Hellbirds. Indeed. Here’s a little video I took yesterday afternoon. I want you to know that I risked my life for this video. I also cut out the part where I run screaming into the garage. So we all rush there and what do we see? 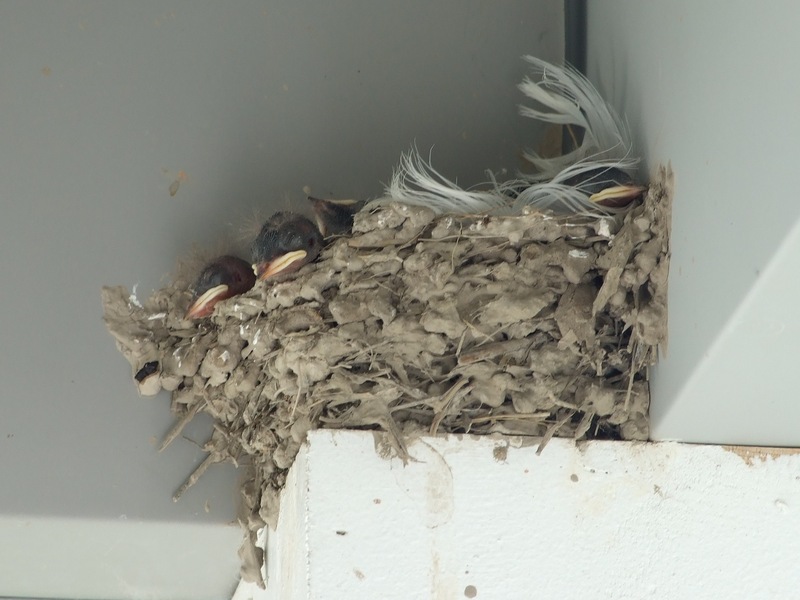 One of the baby birds clinging on for dear life as one of the others tries to push it out. 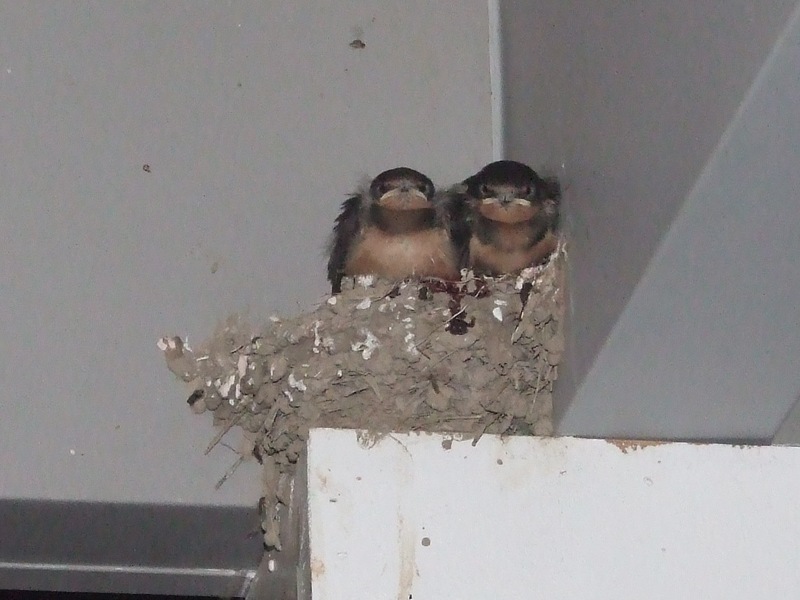 Seems that baby swallows don’t like crowds, so much. In fact, before long, two of the babies were pushed out. Only two cute little hellbirds remained in the nest. In fact, I don’t think that he parents are even nesting there, anymore. At night they’re nowhere to be seen. I suspect that these babies are big enough that they have forced the parents to sleep spmowhere else. And they’re not so cute, anymore. They look more like thugs. Take a gander at how they looked last night. Yeah, pretty much like they’re waiting for an opportunity to break the kneecaps of anyone that comes near their little pooped-on nest. It was actually pretty difficult to get that picture. Their eyes have opened, and now they’re smart enough to duck down into the nest when we even stand in the door on the other side of the glass. When we do that, the parents will fly around the porch, even doing a hovering thing a little bit. If you want to exit our front door, you’ve got to make a run for it. No standing there in the doorway before you exit. You’ve got to make a run for it, and hope you don’t get thwacked in the mad dash. There is an upside to having hellbirds on your porch, though. They’re great for getting rid of salesmen. Is it bad that I love the man-made world so much? I spent about four days last week up in the mountains, up at Camp Frontier. While there is nothing particularly new about my camping, the nature of the camping and the location rather gave my system something of a shock. You see, I had no paved roads. Several times I was quite frightened that my baby (a sweet, sangria red mica 2009 Mazda 6) would get stuck–and I really felt pain when it bottomed out three times. Like, I mean real pain. A tossing in my belly. Know what else? At the camp, I had to . . . how do I put this delicately . . . defecate in a hole. One that did not include flushing afterward. I cannot describe the smell. Well, I might be able to, but then you probably wouldn’t want to return to this blog. Ever. Furthermore, I had no hot running water–although thank the heavens we did have cold running water a short ways off, and at dinner time they did give us hand sanitizer. That made me feel somewhat better that perhaps I wouldn’t die from any number of diseases I might have picked up at the kybo. And–get this. No heat. Yeah, I know, it’s late June, but up there it got pretty cold at night, and–get this–there was no way to stay warm except with my body heat and the sleeping back I slept in. I would like to say that I didn’t curl up into a fetal position, pull my hoody up over my head, nearly suffocate myself with the sleeping back, and whimper. But, I can’t say I didn’t. In fact, I did all of those things, and then I couldn’t move because my feet might extend to a part of the sleeping bag that wasn’t hot from my laying on it. Yeah, no extending my legs out. Every move was like dipping myself into freezing cold water. Holy cow. And, know what else? No electricity. Yeah. I know, right? Downright abominable. My phone/camera RAN OUT OF BATTERIES. I cannot express the relief I felt when I had the opportunity to drive out to Evanston, WY, because it gave me a chance to re-charge the batteries with my car running. Oh, and said phone/camera? Really it was only a /camera because there was no reception out there. How many times did I, out of sheer habit, pull the phone out of my pocket wondering why the devil I hadn’t heard from anyone in so long. Or, wanting to send a message to someone (usually my wife). Have you ever felt cut off? I mean, like you WANTED TO DIE, cut off? Scary. Anyway, it really made me realize how fabricated is the world in which I live. All day, every day, I am surrounded by man-made things. Roads, screens, grocery stores, toilets–please, let’s not forget the toilets. How removed from the “real world” am I? How far removed from “things as they really are” am I? And why–oh why–do I love this fabricated world so much? Well, that last one is easy to answer. When you go camping–I mean real camping–what do you miss? Ode to milk and cookies. Today I ate some oatmeal chocolate chip cookies. Baked by my wife. She has a special talent for baking cookies. It’s something else. A warm cookie, fresh out of the oven, dissolving in my mouth. Sugary. Chocolately. A little of the crunch of baked oats, and the flavor that can only be described as “oatey.” Even a single bite brings thirst. So I get a glass of milk. And how it washes over my tongue with chilling goodness is the perfect way to eliminate that thirst, the flavor of that cookie. One swallow. Two. Three, and I’m ready to get thirsty again. Wow. I just love milk and cookies. It may be my new favorite food. From Monday to Friday of last week I spent my days down in St. George at a one of David Farland’s writing seminars. The topic of this seminar was editing your novel. The seminar proved valuable on many fronts, but the main purpose–editing–benefited me a great deal. Of course, this is just one method. Some people don’t even edit. Some do it differently. I like this methodology. After all, what point is there in line editing if you’re just going to remove things or change it later on? So, take care of the big things up front–like missing scenes, plot lines, characters, and so forth. Then, you’ll notice, the next three edits all involve tightening the book up. The more experience I get writing a book, the more I learn the value of editing. I have 9 books of practice under my belt, now, and each time I write one the process is a little different. It evolves some, each time. It used to be that I would write the book and then when editing simply go back through and line edit. Tweak the sentences and paragraphs. But the once I’d put the structure in place, I wouldn’t change it. These last four books, however, each book’s revision process has become more traumatic to the book. I’ve started taking drastic measure upon revision. Changing chapter sequences, deleting scenes, adding new scenes, combining characters, changing motivations, re-writing complete plot lines, removing entire swaths of book, adding others. In the end, I’m certain that the more you write, the more willing you are to make big changes because the less sacred your writing becomes. It’s a point that’s difficult to reach for many reasons. You hear stories about writers (such as Orson Scott Card) who write a first draft and then ship it off for publishing–and you want to be awesome like that. Or, you have very little time to write, and every page you remove counts as significant time lost. Possibly, you just can’t admit that something you wrote is poop, and needs to go. But here’s the thing: when you reach the point that nothing is sacred as you edit, that you’ll throw anything out and sacrifice anything and spend any amount of time to fix something–that’s when you can gain true power as a writer. You can write things you never thought you could write, and when you can make your stories truly great. Because chances are unless you’ve spent a lot of time thinking about it up front, and quite a bit of time exploring a lot of the options, the book or story isn’t as fantastic as it could be with a little more work. Yes, it means sacrificing something–time, your pride, comfort–but in the end you come out on top. The end of each chapter includes a summary of the points of the book. My summaries on the blog recreated much of that information. I suppose that my summarization might reduce the need for someone to buy the book. And I’m generally in favor of writers having people buy their books. So, it’s probably enough for me to say that the book is excellent, and if you edit any fiction, you should read it. It got downright tedious posting the summaries. So, I stopped posting the summaries. The book, however, is excellent on many levels. If you write fiction, I recommend that you read it. Here in chapter 5 we get a nice lesson on dialogue mechanics. The basic lesson is that you want your mechanics to be as transparent as possible and not get in the way of the dialogue. “Show don’t tell” is once again the star of the chapter. “Stop eating that pie,” she said angrily. We want reader to feel the emotion in our characters–not know about the emotion. If we tell readers exactly about the emotion, they cannot interpret it the way that best suits them. So, show them, instead..
Also watch out for description that tells about the content of dialogue–you show what someone is thinking and then they say what they are thinking. That’s twice your readers learn about it. One time too many. A lot of the time, dialogue explanations come in the form of -ly adjectives, which is another reason to get rid of such words. In the end, the only reason to use speaker attributes is to show readers who is speaking. No other reason. Not to convey emotion or to tell how someone said it. Because of that, we should use the word “said” almost without exception. –Don’t open a paragraph with speaker attribution. –Decide how you’re going to refer to a character for a scene and stick to it. –If it’s clear who is speaking, get rid of character attributions completely. –If you’re getting tired of the number of beats, insert a beat, instead. A beat is a piece of action. In my example above, it’s the slamming of the fork on the table. –To show an interruption, use dashes. –To show someone trailing off, use ellipses. –Start a new paragraph with each speaker. And, there you have it. Dialogue mechanics. This very simple idea is pretty easy to forget when you’re in the moment of writing and you find something great to add, or want to include a bit of research you’ve done. The book especially warns about focusing too much on unimportant actions and pet topics and hobbies. The solution to this problem, according to the authors, is to pay attention. Notice what you spend a great deal of time on. Anything that is focused on for very long will create an expectation in readers. If it doesn’t end up being important later on, readers will be disappointed. Also, it doesn’t hurt to set the book aside for a little while and then come back to it. Approach it as a reader, not a writer. This will give you a fresh perspective on the content and will help you see what things are out of proportion. You may also discover that parts of the book that are small might be worth expanding on. You can also use proportion to create tension or surprises. If you spend less time on something at the start, and then make it important later on, it can give a nice twist to the element and plot. The authors also note that you don’t have to cut EVERYTHING that doesn’t relate directly to your story, but anything you add or leave in should somehow add to the story in a way that resonates with the rest of the story. As far as description goes, and avoiding too much detail to throw something out of proportion, allow your viewpoint character’s interests to control the amount of description. Only devote the amount of attention to something that your character devotes to it. So, there you have it. Proportion. It’s a tool. Use it wisely. Next up: Dialogue Mechanics. Oooooh!